March and April always lend themselves to so much craziness in our household -- I'm wrapping up another semester of my graduate program and we're trying to buckle down in many ways before the weather warms up. This recipe comes from one of my favorites Molly Yeh, of both My Name is Yeh and Food Network, she just seems so down to earth and her recipes are unique. 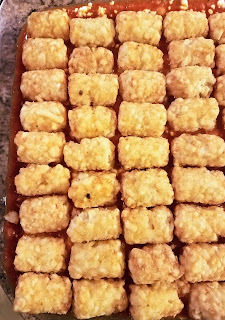 Although I'm also from the midwest, Ohio isn't particularly known for hotdish (essentially, a casserole) but Molly talks about hotdish so much I thought we would give her vegan hotdish recipe a try with some modifications. 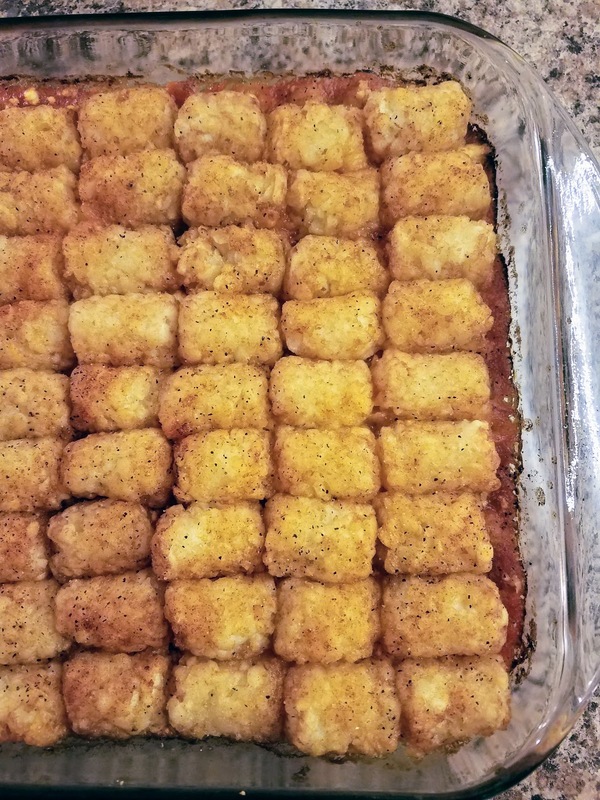 We served this when a friend came over for dinner and we were all impressed with the calorie to portion breakdown once the hotdish was served. 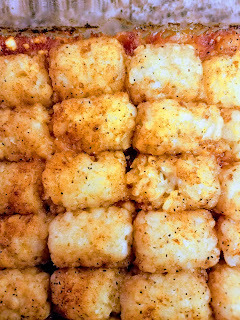 The flavors in this were good and the tater tots were crispy. I used a mild harissa paste, but I wish that I had used both mild and hot to give this an additional kick. 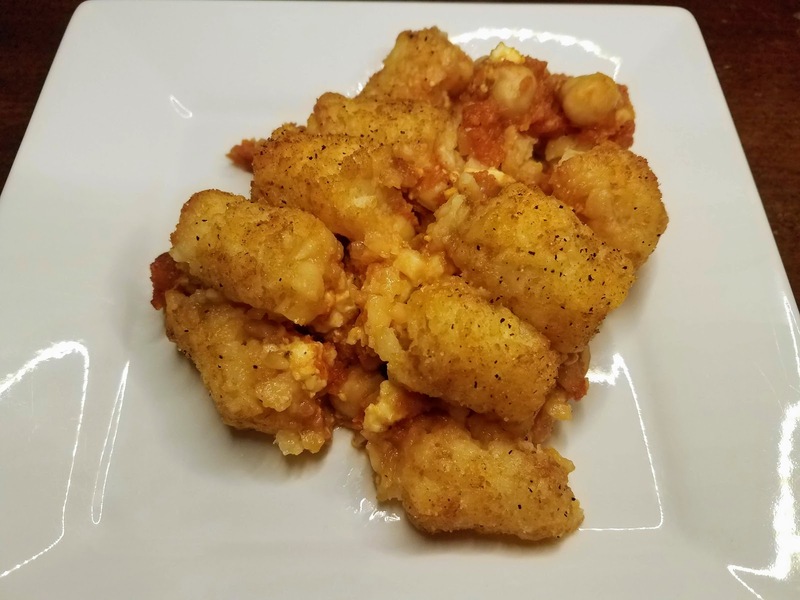 This is certainly something I would try again, maybe I'll attempt to make one of her other hotdishes as a vegetarian version. Recipe slightly modified from My Name is Yeh. In a large pot with neutral cooking oil or cooking spray, add the onions and cook until soft, 5-7 minutes. Then add the garlic and harissa paste and cook for 1 minute more before adding the wine. Reduce the wine by half and then add the chickpeas, 1/4 cup of water, thyme, and salt and pepper to taste. Bring to a simmer and cook covered for 35-40 minutes. While the chickpeas cook start the sauce. In a separate pot, heat the olive oil over medium heat and add the onion, carrots, celery, a pinch of salt, tomato paste, and paprika. Cook for 10-12 minutes or until the vegetables have softened. Add the chopped tomatoes and sugar, cook the sauce covered for 15 minutes. Remove the sauce from the heat and pulse the vegetables with an immersion blender until the sauce is smooth. Season with salt and pepper to taste and then add the chickpeas. 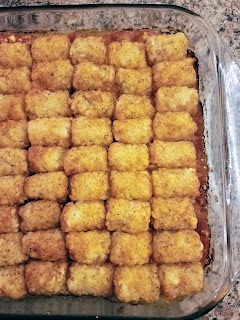 Transfer the mixture to a 9x13 casserole dish, top sauce with the 4 ounces of feta, and then top the entire hotdish with tater tots. Season with salt, pepper, and additional paprika for color. Bake for 30-40 minutes or until the tater tots are golden. 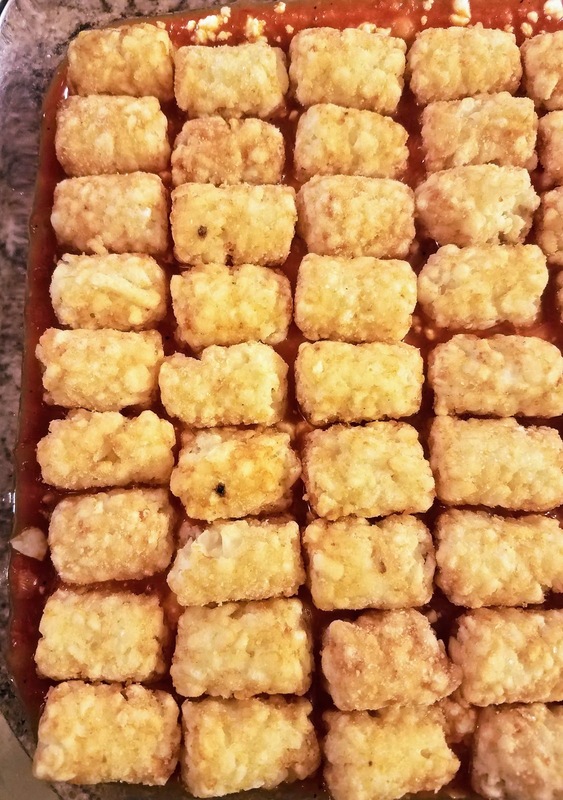 Once the tater tots are fully cooked, remove the hotdish from the oven and allow it to cool slightly before serving.